I recently ha to pick up yarn form Hobby Lobby. I really don't like shopping there but it was across from my knitting group and I needed yarn. They have been slowly pushing out other brands and replacing them with their own. Most recently they have gotten rid of (or are in the process of getting rid of) Caron Simply Soft (CSS) yarn and replacing it with their brand Yarn Bee Soft Secret (YBSS). 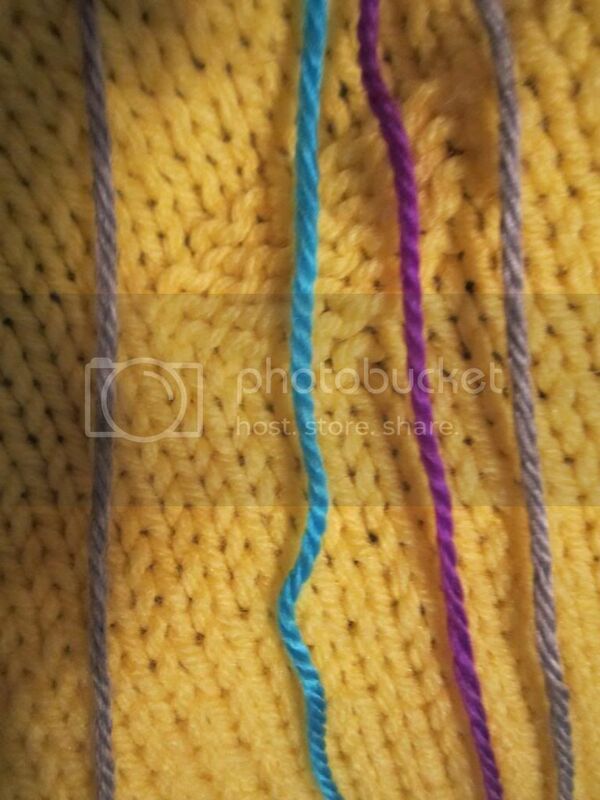 At a glance they look similar, thin weight yarn, lovely sheen, vibrant colors. Would I recommend YBSS? NO! My skein of CSS heather grey had 315 yards of yarn. the YBSS had 370 yards. So by yardage there is more yarn. But this yarn is very loosely plied which causes it to compress to a smaller size. Here is a closeup of a blanket I am working on. This blanket is a collective blanket so I do not know what the square are made from because they were sent to me from around the world. But I am assembling them in CSS grey heather. I purchased the YBSS in the rainbow colors. This is how they crochet together. I used an I hook. *click on the images for an enlarged view. Here is a side by side of the CSS (grey) and YBSS (blue and purple) yo ucan see the ply is looser. 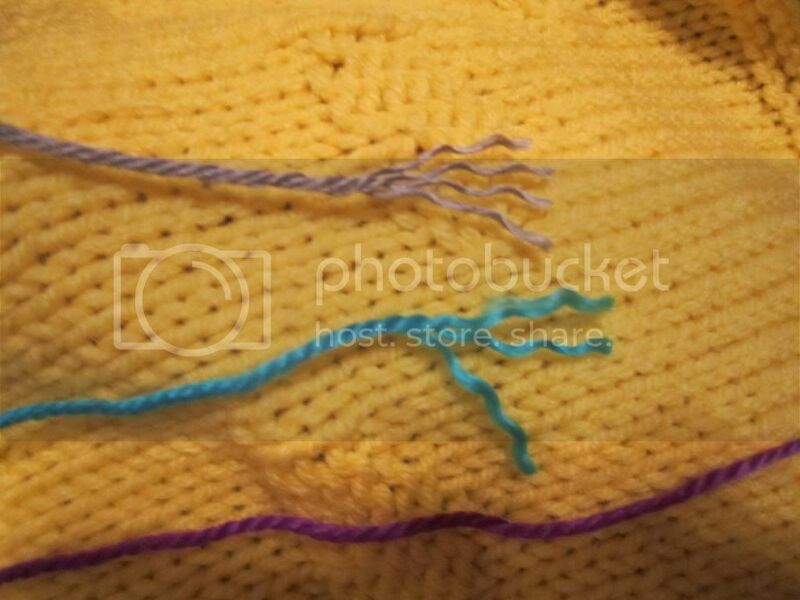 Here I split the plies of both yarns. you can see the CSS is spun much tighter and is a 4 ply yarn. the YBSS is only a 3 ply yarn and is spun much looser. Also when walking through the store the and when I put the yarn on the counter it had left lots of lit on my shirt. Caron's Simply Soft is on the lightweight end of the "worsted" yarn category (#4) to begin with, and that was great for what I was trying to do. HL's Soft Secret is, in my opinion, not even in that category, though they say it is on the lsbel. In reality, this is a "sportweight"(#3) yarn (in fact, I have #3 yarns that are actually heavier than this stuff) and yes, it is only a 3-ply loosely twisted yarn. The fact that HL misrepresents it is extremely annoying. When I tried working a stripe in the HL version, I ended up with an absolutely horrible mess because the HL yarn didn't even come close to making gauge. My recommendation? Do not buy this as a substitute for Caron's Simply Soft; it might work well for some things, but be aware that it should actually be labeled as a sportweight yarn and if you buy it, you should want a yarn of that weight. The recommendation on the label to use #7 knitting needles is simply ludicrous—I'm using #4 needles on the project I'm trying to complete, and the stripes done with this yarn, despite my attempts to knit very loosely to minimize the difference, are barely opaque. I found that the YBSS has more than an average number of mill ends and knots in it, as well. I wouldn't use CSS for anything. I've tried making baby things and once it's washed it becomes a limp rag. I made a shrug to wear over a dress to my sons wedding rehearsal dinner and after I knitted it and before I could even get the buttons sewed on it was so full of pills I threw it and all the other CSS I had in the house in the trash! CSS is junk! Horribly cheap stuff...After all, "made in China" should warn anyone not to use it....It sheds terribly and I keep getting fuzz up my nose! Hobby Lobby needs to go back to the drawing board on this one.. 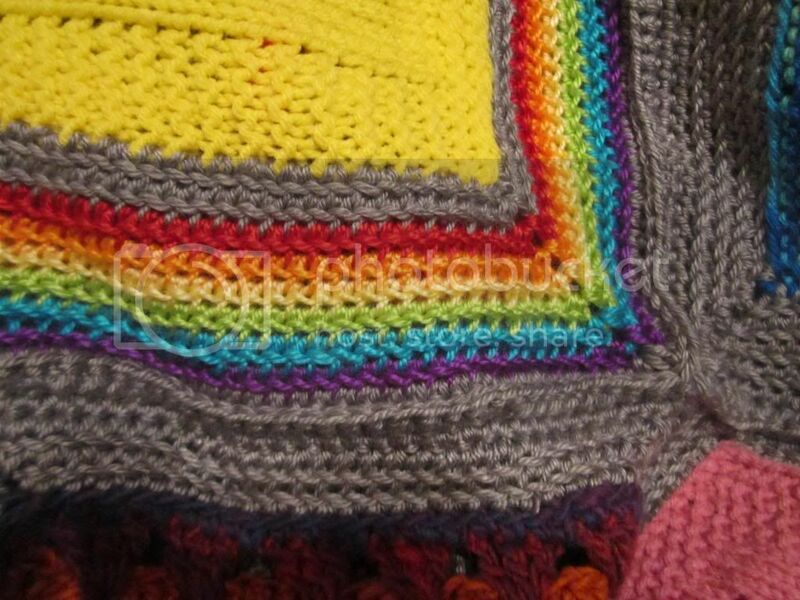 I used CSS to crochet my granddaughter's afghan. It turned out great - washes very well. I wanted to get more at HL & found only YBSS - will not be getting it! Thanks for the info! Thank you to everyone who posted. It is a big help. After three false starts with test blocks and hat ribbing, I could not make the gauge work. Fortunately, I have two unopened skeins which can be returned. Back to CSS if I can find it. Didn't like CSS it split I had too much trouble. I'm trying YBSS. I do like other Caron yarn though.